Actually depends on the case, the main obstacle is the space available in each tab, but as you mentioned there are also minor flaws in some palettes and maybe being extremist the designs would gain a lot by integrating certain details present in the rest of the sprites. , for example the relief on Sonic's eye, but that is unnecessary, since in general these details are barely noticeable. 1. & 2. All the things that you mention and some more I have found them, but I could not do much with that ... Theorizing I can say that the place where Scrap Brain should be has been reused, besides I have only found 11 potential blocks to draw zones (of 16x16) in this level, for the Esmeralda del Caos planned to create an emerald-like ring and continue to investigate, also thought to include some additional tabs with graphics to facilitate any future project, but being honest the project now It is stuck because of work issues, since I have not managed to have time and energy together. From the first time I saw that image I was wondering if with enough effort it would be possible to see these sprites running in the game for real, in the past I had seen a small project that tried to incorporate tails in the Somari, but I did not return to receive news of it. Hello for those who read this for the first time this project tries to improve the aesthetic section, and optimize as much as possible everything that is within my reach. ● Crashes and unexpected events were reduced. ● Almost all the animations were retouched. ● The tileset were optimized and new elements were incorporated. ● Work on a new title screen. What should not you expect from this project? Any modification that requires advanced knowledge of assembler 6502. Currently I have less time to devote to the project, this has been reflected in less status updates and a slower development, but despite all the project is still standing, which is the most important. ♦ I remembered how I used the debugger. ♦ I managed to repair the graphic glitches of the first Zone and improve its decoration. ♦ I found the sector that stores the configuration of Sonic animations and palettes. ■ I have no idea how to repair the Spring Yard Zone ramps, I suspect that the problem has to do with the collision area of ​​the block that can be seen in the model, it seems that it was placed incorrectly, also a second problem that I find is that the inertia generated by the spring is sometimes insufficient to overcome some ramps (These values ​​are always fixed), in addition when the player presses forward this inertia is lost completely. * Some landscapes shorten abruptly or there are sectors that lead nowhere. ** Originally I planned to give it a style closer to that of megadrive, but I have many doubts about this, because in my opinion this level ruins the rest of the game, since there you can get too many lives, things that should not be like that. *** Two things that must be taken into account I still do not know how much this problem can affect my objective, I also consider that the greatest defect of the enemies is their terrible programming although thinking it from the point of view of the Eggman are perfect. Looking Cool so far! Keep up the good work! ♦ HUD correction to match official games. ♦ Now the loops have relief. 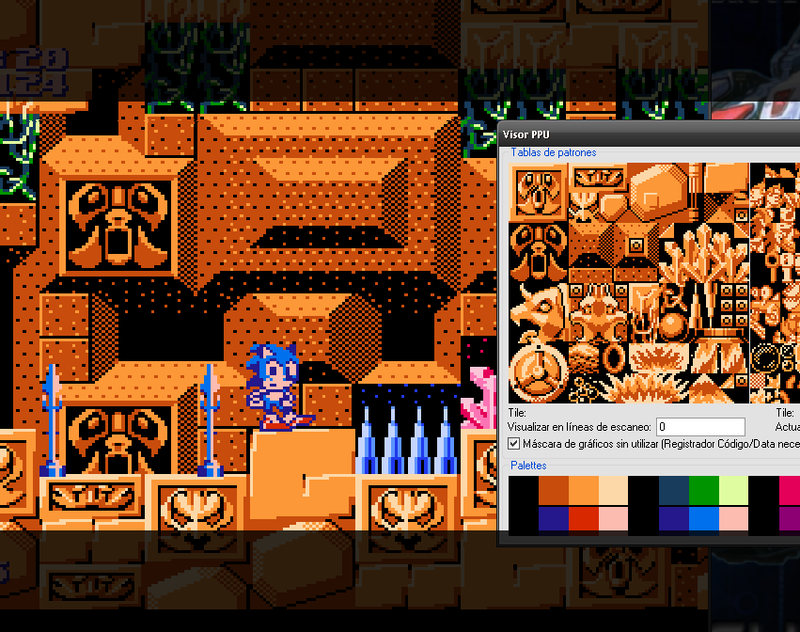 ♦ I started to correct the palettes that are used in Sonic animations! ♦ The graphics of the Final Zone were renewed. Mockup. I was lazy to make a real catch. ■ Maybe I should keep working on the sprite of looking up. How were the animations updated? Was it frame/sprite order that was modified, or just CHR touchups? Also, have any other aspects been updated, like the ending or music? Is the spindash still CD-like (with one charge needed to go at full speed), or has that been modified too? It simply don`t look anymore as a hack for the Nes.... But a "solid" Sonic game! 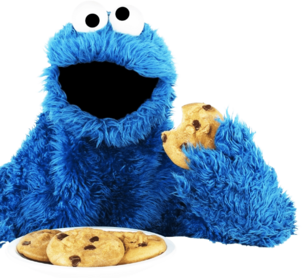 3a51a Function will execute according to the action performed by the player. 3803e Orientation of each sprite. * This discovery is very recent so I have not checked it properly, but I found a block that seems to be full of pointers on top of the other data. But I still have not decided whether to replace the pipes of the consoles by more simplified versions to include other elements that I have the feeling that were missing. About the music without anyone to create new sound sequences it does not make sense for me to investigate about it, also I think there are more qualified hackers in that section than me. On the physics of Sonic if I'm not wrong are around 3acxx, but my knowledge is zero, so I can not do anything useful with this information. Can NES really display so much colors at once? Amazing job, I watched a gameplay from a previous version and it's really good. Do you think there's a way to make Sonic controls feels more like Genesis/Mega Drive? The way it plays now it seems it could have a little more "gravity" to it, what are you thoughts? Again, can the real console display such a colorful game like this? Personally I think the game would win a lot repairing the enemies, recently observing them I discovered that they are activated by proximity of the X axis, so adjusting that value (If it exists) the game experience would change completely, it is also necessary to increase the inertia produced the springs that drive towards the side, for my part I am open to any kind of collaboration. I hope this helps you with editing animations. 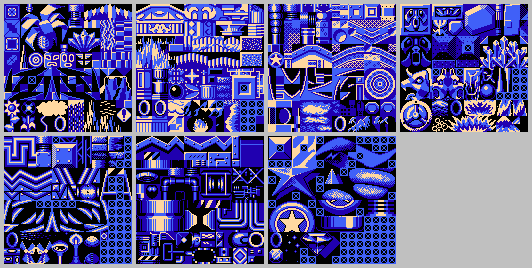 That Final Zone tileset seems to have diagonal floors, ceilings, a conveyor belt, and rings. Possible return of Scrap Brain maybe? On the other hand, I decided that it would be best to take into account the missing elements in the tab of this area when optimizing it, in this way the next hacker will have a solid base to start working. Currently I have all tentative tileset of all levels, but before applying the missing ones I must finalize certain details, as is the case of Star Light with its background elements, for example. Being completely honest I do not like that game, besides I am more of the green Mario , about future work before embarking on any new project I must find the balance between my work life, study and my hobbies to avoid routines as overwhelming as current , during that process I am considering uploading some of the work I do for my personal collection, but that is just an idea at the moment. This is looking absolutely fantastic so far, I couldn't believe that someone could improve on The Jabu's work as much as is shown here. This is true talent and passion combined. I really hope that after this is finished someone else will take up the reigns and try and improve the game in other ways, pushing it as far as it will go. Also, if anyone has contact with Hummer Cheng himself, I'd love to see how he feels about this. I've been meaning to ask @sics, what kind of ROM base are you using for this hack? He praises me a lot, but being honest it was thanks to the work of FuriousTH that I decided to try it, he was the first to show what a "plus" of love could do for this game, I must also say that I have taken as reference the work of many artists what I respect But thanks for the flowers! It would be great to know what talented people could achieve, I would like to see all kinds of projects arising from this work arise! The work done by the Hummer team is admirable, although it is notable that at that time they lacked a lot of experience, there are a lot of graphic optimizations and really creative solutions that show that they really tried to do a decent job, I personally think that they have more to be proud of than many licensed developers of that time . I would like to create a rom only with the changes that I made, but I am aware that many had difficulties with this system in the past, on the other hand I know that the rom on which this project is based is available on the internet, but I am afraid that in a future ceases to be as accessible as it is today, for the moment I think it would be best to use the original rom as a base . It would be great if someone created a new way of patching to solve this problem, to use several source files or even several versions of a hack at the same time, include metadata, group those changes, title them and add some reference images are things with which I'm sure many of us dream. On the other hand I'm already applying the fourth tileset, but in this case I suffered a mishap with a graphic error that produced a certain block in Labyrinth*, but fortunately this was resolved by relocating a certain sector of the sprite that makes it up, that's why there was a lot of space free, instead of moving it I decided to duplicate it and thus avoid having to modify the other blocks that share that graph. I also evaluated moving all the graphics, to find another way to order them without this error occurring, but the truth was that I was not satisfied with the result of this process. That in-game screenshot looks like something you'd see if Sunsoft made a Sonic port (as they were still around during the 90s)! Also the tile arrangement looks good too. Speaking of, since Chaos Emeralds are now implemented, are there multiple endings depending on how many you have? And were other elements implemented, like the scene before it with Sonic releasing the emeralds? Also was the "Sonic Team Presents" text put back too? I found the unused graphics of the "Somari Team Presents" version, so I'd imagine it's possible. Also also, there's a bug in Labyrinth with floating platforms. Basically what happens is that when on the platform, Sonic can go through any wall above him while the floating platform continues to rise him up. Sometimes, doing this crashes the game. I think I know why this happens. 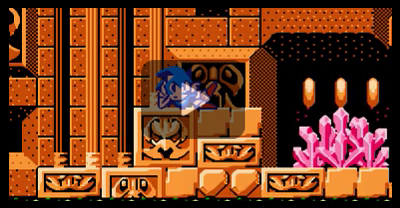 Usually, in the original Sonic 1, doing this makes Sonic die from being crushed due to wall/ceiling collision. There doesn't seem to be any ceiling collision here; if you walk in any direction, you can't zip like in the original and go to the far opposite direction of what direction you press, you just "fall" through the ceiling. Fall as in "Sonic continuously going upwards while the background/camera freaks out until you reach the actual level map." Is there a way to fix this? Lookin' smooth, can't wait to play it when it's done.